I’ve always been a fan of Stuffed Bell Peppers (or zucchini). 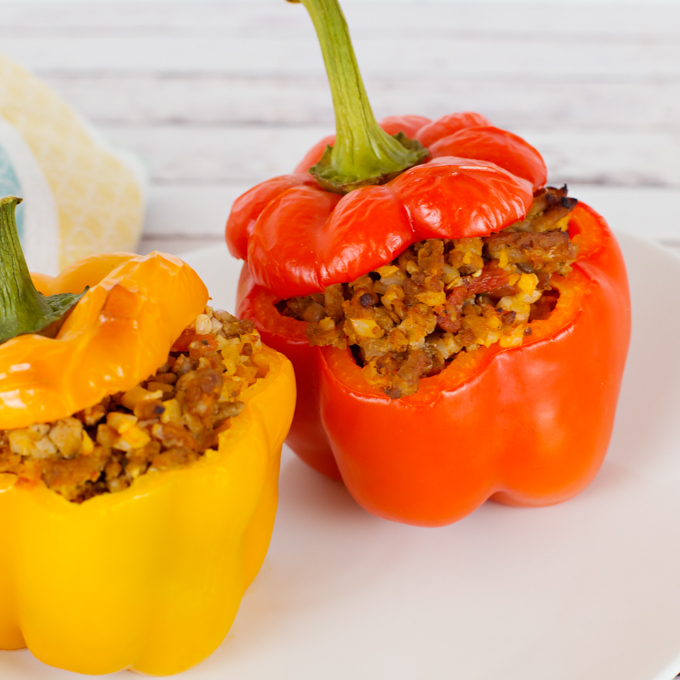 What’s not to love about a delicious filling of meat, rice, tomato, and seasoning, stuffed inside a fresh veggie topped with cheese and baked to perfection? Nothing, unless, like me, you’re following W30 and challenge yourself for a month of giving up certain foods. No problem. I few recipe adjustments and we had a delicious, hearty, comforting dinner. You will notice the absence of cheese. Yes, that made me a little sad, I’m a huge cheese lover, but honestly these were so good, I barely missed it. Oh, and the rice, isn’t really rice, it’s cauliflower rice that I got at Trader Joes. I served these with a little side salad with homemade Balsamic Dijon Salad Dressing. It really was a delicious meal!! The picture above shows them ready to go into the oven. Below they’re straight out of the oven. They don’t look much different (since the filling was already cooked), but the bell pepper is tender, slightly wrinkled, and just beginning to brown. Old style, without the lids oozing in melted cheese they’d be very different looking, but let’s not go there. Is following W30 making you hungry yet? 1½ # ground meat (beef, turkey, pork). I used a combo, but anyone is fine. Cut tops off of bell peppers, and remove seeds & ribs. Rinse and set aside. In large saute pan, brown ground meat over med high heat until cooked through and brown. Remove from pan. Reduce heat to medium and add in onions. Cook for 3-5 minutes until translucent. Stir in crushed garlic and cook another couple minutes. Add meat back to pan, along with tomatoes, chicken or veggie broth, and spices. Cook over med/high heat until liquids reduces and is thick. Taste and adjust seasoning to taste. Stir in rice and combine. 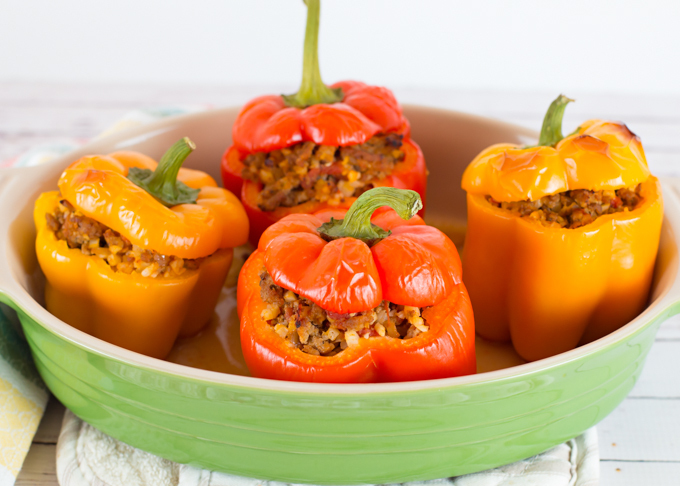 Fill peppers with meat & rice filling and place in oven proof dish. Add about ¼ cup water to bottom of pan. Cover loosely with foil and bake for 30 minutes at 350*. Uncover and bake for another 15 minutes or until just starting to brown. Bell peppers will be tender when done. Stuff bell peppers are awesome, wholesome meal :D.
I love stuffed bell peppers! Awesome recipe with so many flavors! Wow these look so tasty! I haven’t had stuffed bell peppers in forever. Thanks for reminding me. If all meals in the Whole30 plan were as enticing and yummy looking as this one I would be such a happy girl! Thanks for sharing!! 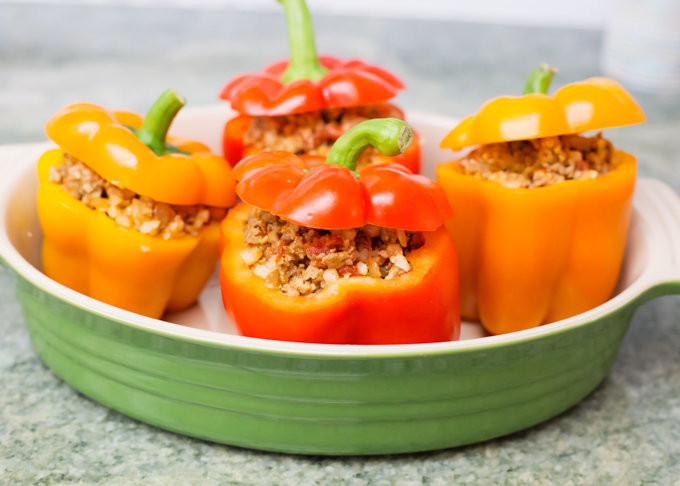 These stuffed peppers look so tempting. Trying them for sure. Thanks for sharing. 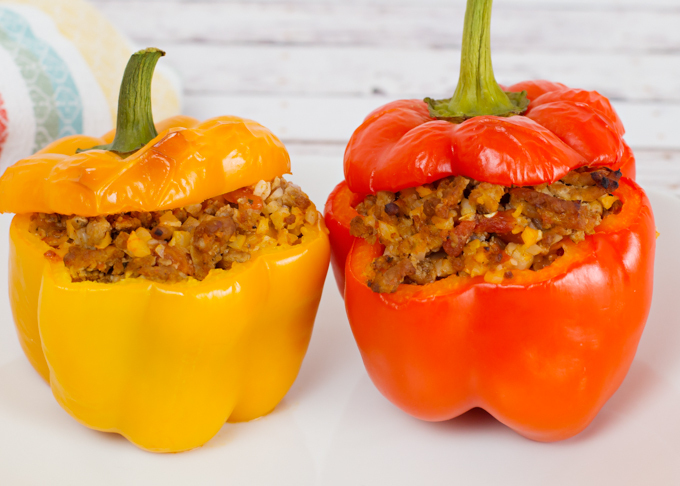 Stuffed peppers was my favorite growing up. I will have to try this on my family! These look delicious. Going to make this weekend. Thanks for sharing.